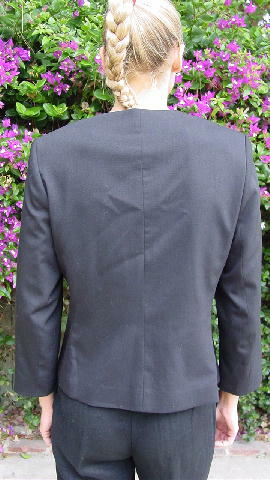 This black vintage Oleg Cassini jacket is 68% polyester, 30% wool, and 2% lycra, and has a black 100% acetate lining. It has a full front zipper with a golden brown lucite-type modified triangle pull. 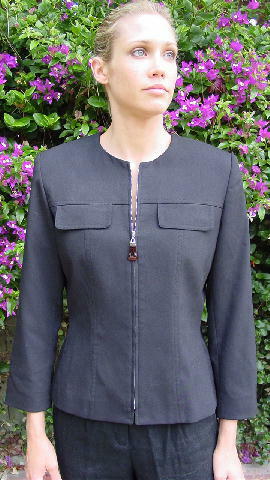 There is a jewel neckline, shoulder pads, long sleeves, and two faux pocket flaps. The tag says it's size 10, but it fits like a size Small petite. shoulder pad to shoulder pad 17"